I Think I should Get a Prize! Instead… I offer you a No-Prize! 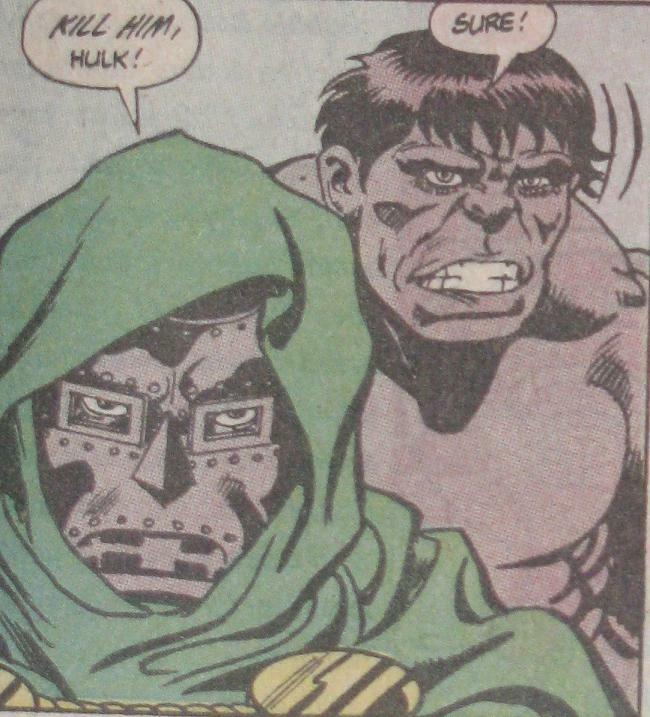 Guess the issue of what comic this panel came from and you get a no-prize for sure! Zeno is usually pretty good at getting these – so is 465 – but who will it be this time? And how long will it take? We shall see! The couch has been taken over by green! 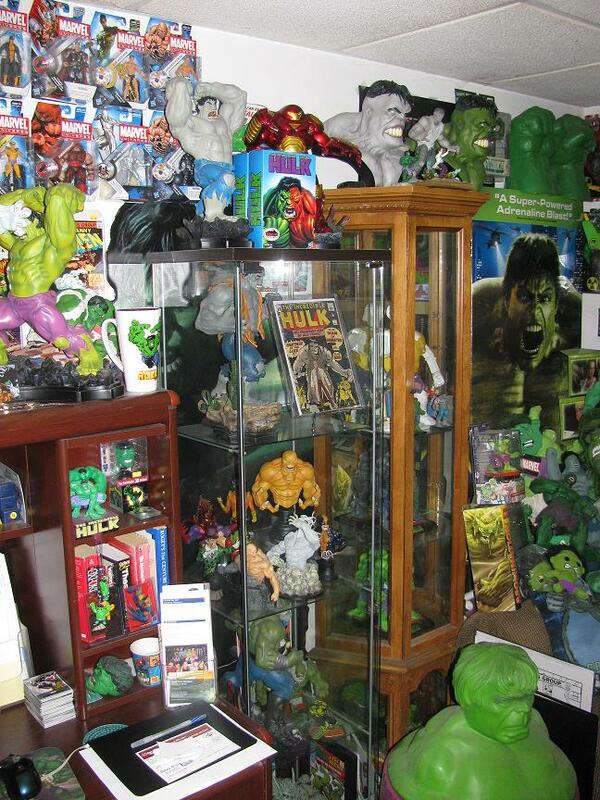 #1) There is no order in the Hulk room… I mean, there is SOME sort of order – but it’s MY order. I like chaos – I thrive in chaos. 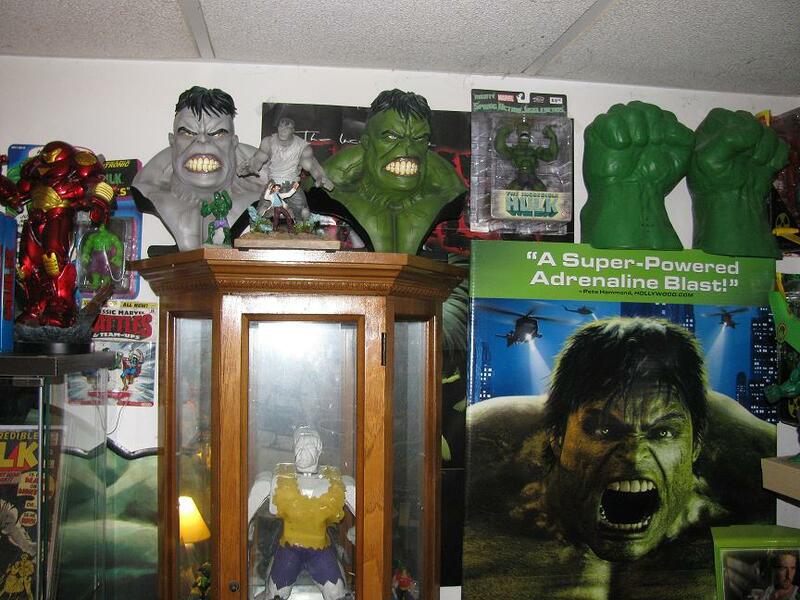 The Hulk room also seconds as my office so a lot of times, when I purchase something new, I usually find a place for it short-term and then get back to it when I can. Many times these items will just be stuck up on the wall or put on a shelf until I get to it later. 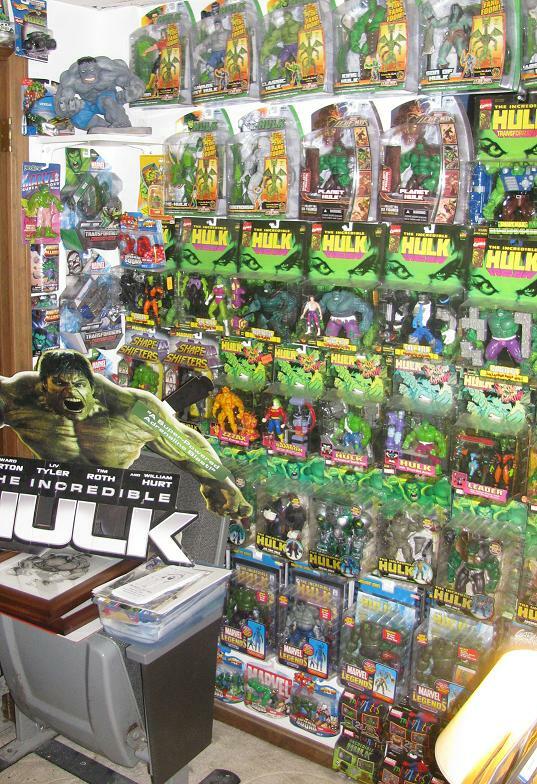 The Action Figure Wall... pretty much every Hulk figure is on this one wall! This is mainly for two reasons – the first being that back in the day I used to get stuff so fast and furious I would not have the opportunity to really think about where to put a piece before more boxes and comics came rolling in. That’s not really the case so much anymore – and that’s because, the second reason, I am planning a HUGE renovation on the Hulk room. I have an enormous display case in the works – I am knocking down a wall and expanding, just slightly, the whole room. 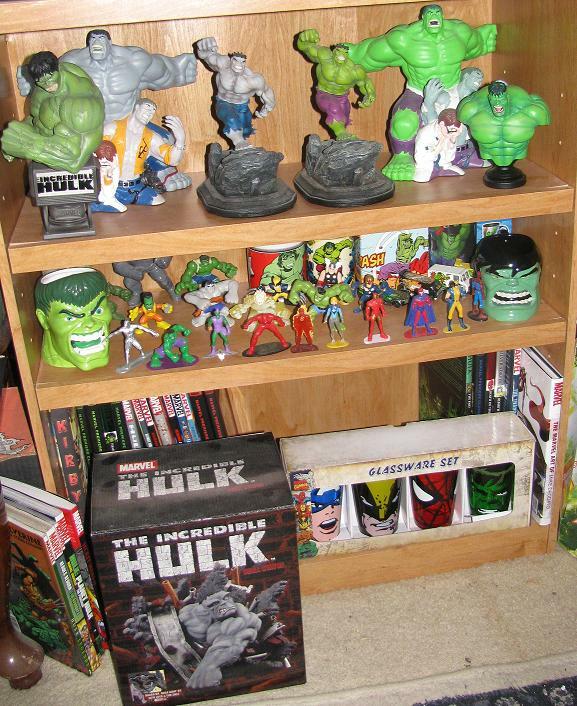 Shelf #1 - with the "Planet Hulk Shelf" at the top! Also, since I had an addition on the side of my house built – and the addition was designed with a crawl space in mind – and the only place to put the entrance was to cut a hole in the wall/concrete foundation of my house – the only real space it would fit was… yup, you guessed it – right in the middle of the Hulk room wall. I have left out pics showing the crawl space entrance mainly because it is an eyesore – but also because it’s nothing but a big square hole in a wall. Part of the renovations I am planning is to build a small wall with closet doors to hide said hole. 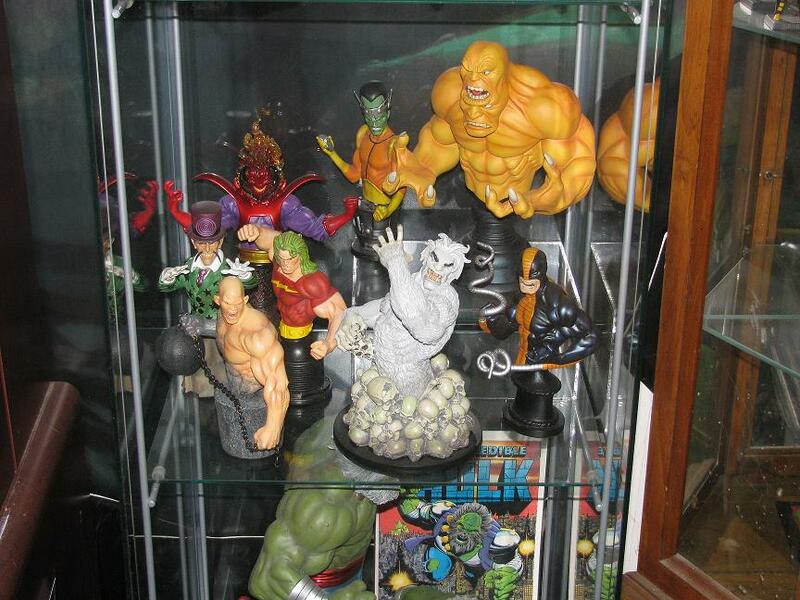 Display Case #1 - this hold most of the Bowen and Mego goodness! Now #2) You may notice there are some items in the pics of things that I have not posted – please don’t ask me to post them – I will get to it as soon as I can. There are also items that I have posted that you do not see – there are a few reasons for that. The first is that about a third (maybe more) of the collection is in storage. Things that have no real rhyme or reason to put somewhere – for example, the Hulk backpacks, toothbrushes, coloring books and more. Desk - MU across the top - and a recreation of #181 Bowen Style there too! Next, there are certain items that are no longer in my collection. The first thing that comes to mind is the Hulk PF. While it was extremely hard to let that piece go I couldn’t just watch as a piece like that was climbing and climbing in value and not take advantage of it (especially when I had a few repairs to do to my house). I could have saved and made the repairs – OR – sell one statue that could never survive the current value it was at. I chose the latter. I have no regrets – and am pretty certain that further down the line I will be able to pick it up again when the value has dropped. I mean, come on – it’s inevitable that these collectibles will drop… anyone who thinks otherwise – I have just three words for you: Beanie Babies anyone? 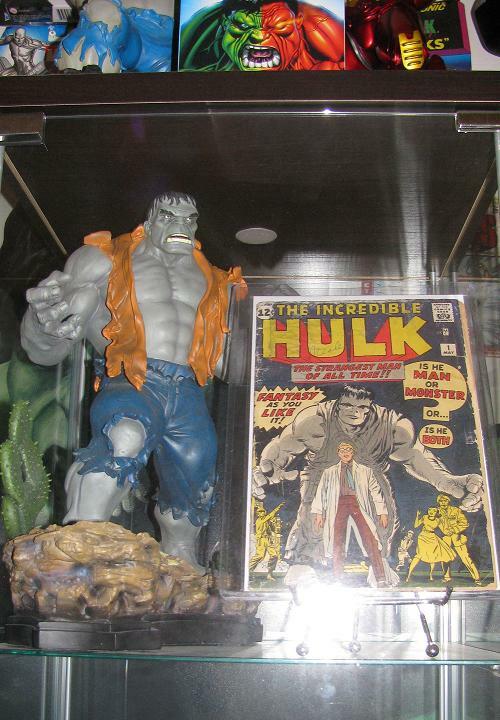 There are a few pieces I have let go – like the Grey Hulk Hard Hero statue. 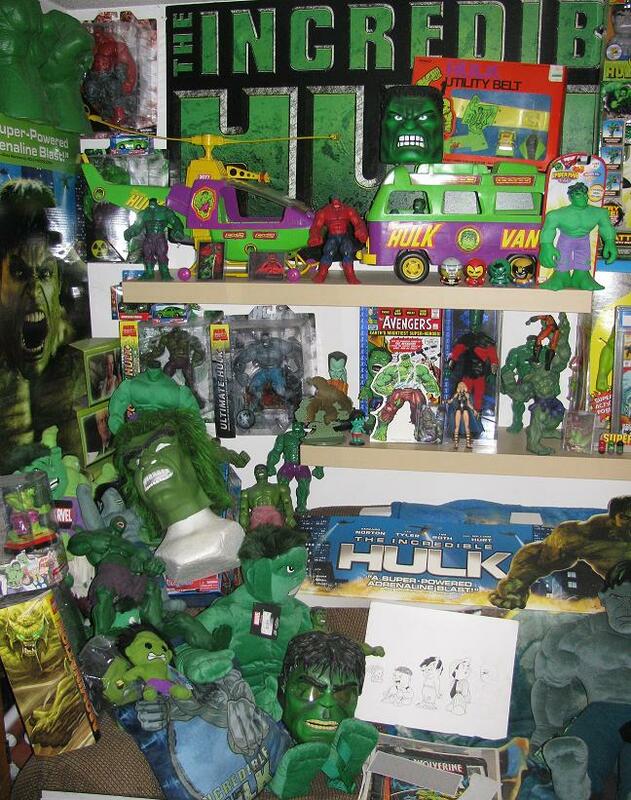 I wasn’t really a fan so I had no problem selling it – and with the funds I was able to purchase more Hulk items that I wanted. I’ve sold some comics – mostly doubles – as well as some art. 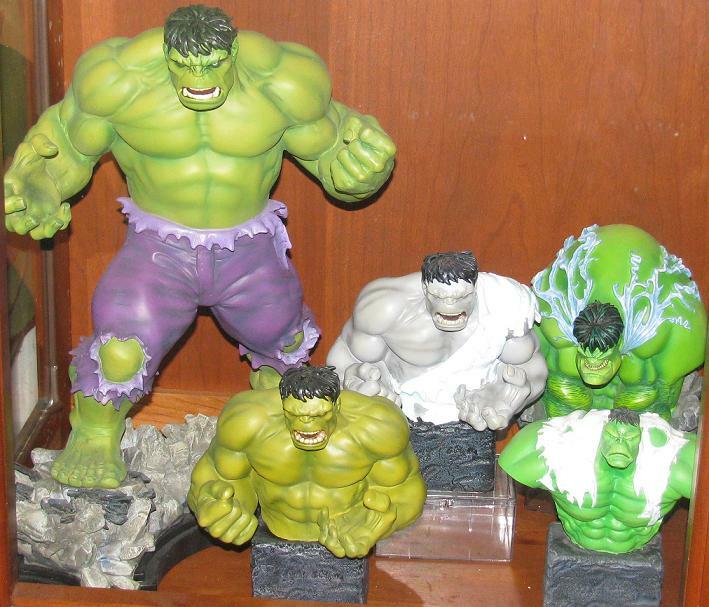 Lastly, there is something Hulk in EVERY room of my house. When I say every – I mean EVERY. 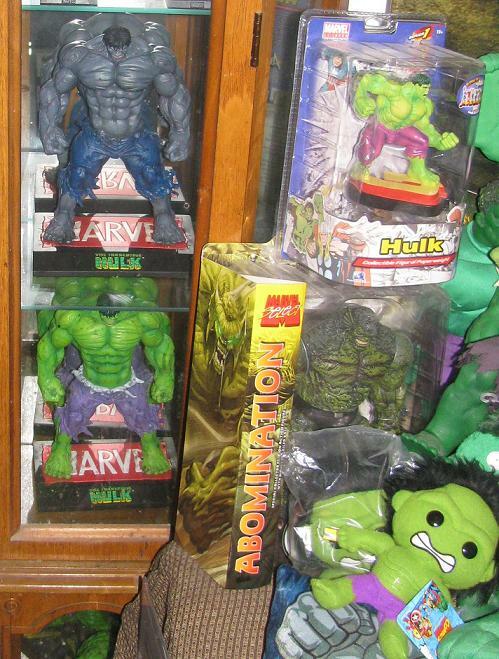 I put at least ONE Hulk thing in each room. 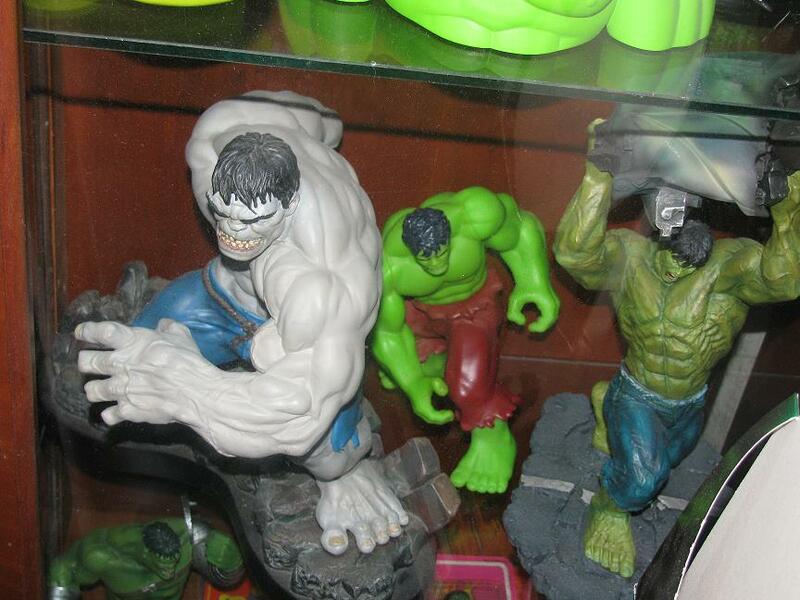 So, there are some action figures in the kitchen, pictures in the hallway… the Hulk is ever-present. 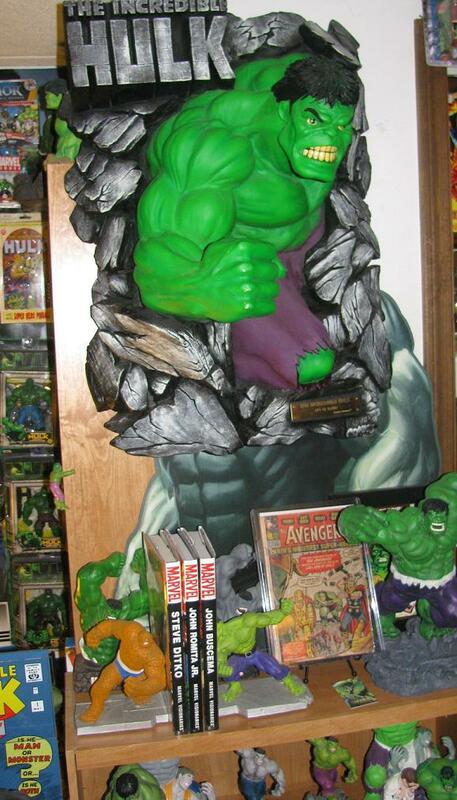 But never more so than in my bedroom where the Dynamic Forces Life Size Hulk Head sits. Also, my entire comic collection sits right outside of the Hulk room door – and my Marvel Masterpieces and Omnibus collection is snuggly placed in the bookshelf in my living room. 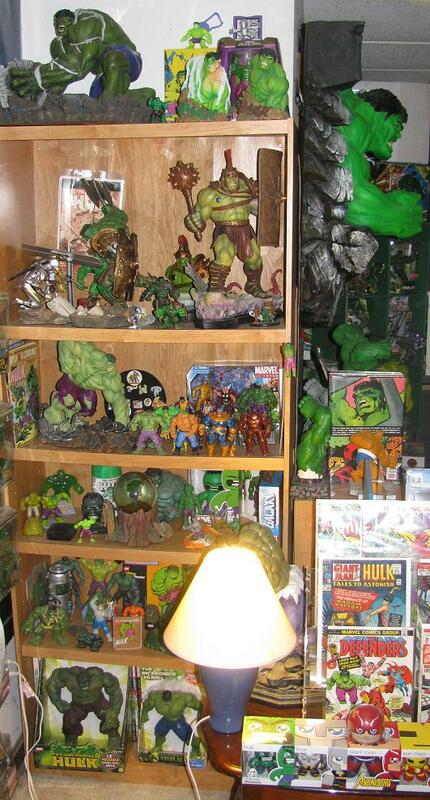 And #3 – You may notice that not everything in the Hulk room is… well, Hulk. 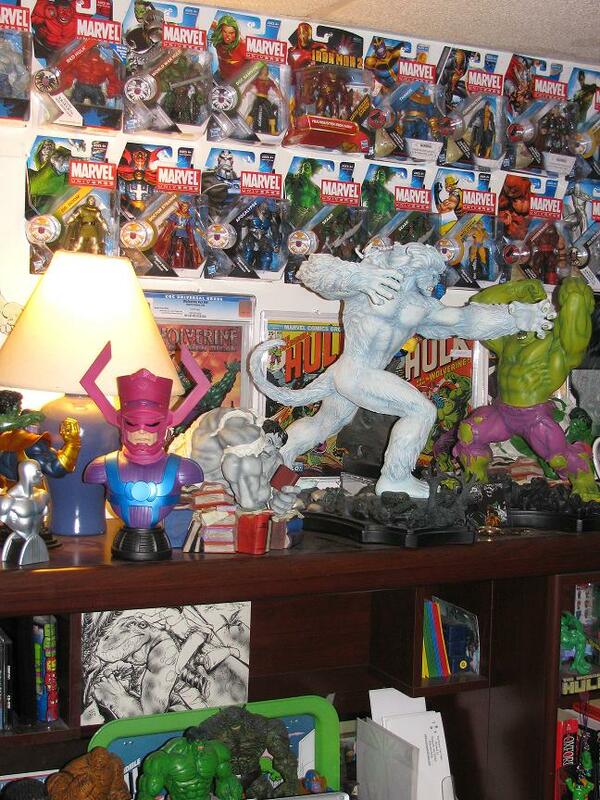 I do have the Galactus Bust from BD, as well as the Surfer and my 2nd favorite Marvel character, Thanos! While it would be nice to think that I could just limit myself to Hulk – I do love me some classic Thanos! Original Hulk Fists! The Best! 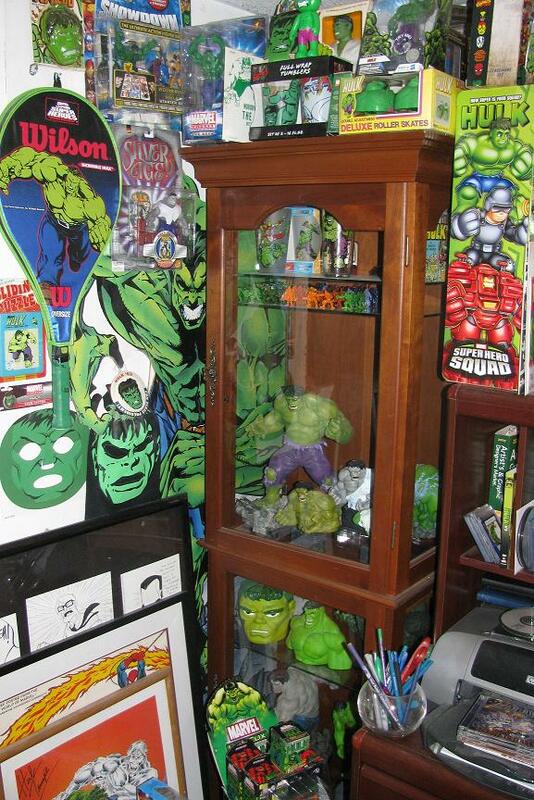 So, tell me what you think of the Hulk room – do you have a similar set-up? Let me know! And please, ask any questions you would like to know (except asking me WHEN I will be posting stuff) including how my wife feels about it – if you’re curious. By the way, my daughter IS allowed in the room under strict supervision. 🙂 Just until she is old enough to understand that she can’t open or play with any of Daddy’s toys. Not to worry though – she has plenty of her own Hulk toys to play with – as you guys saw when I posted a pic of her last week with her Hulks in a baby carriage. Green and Grey... gotta love it! 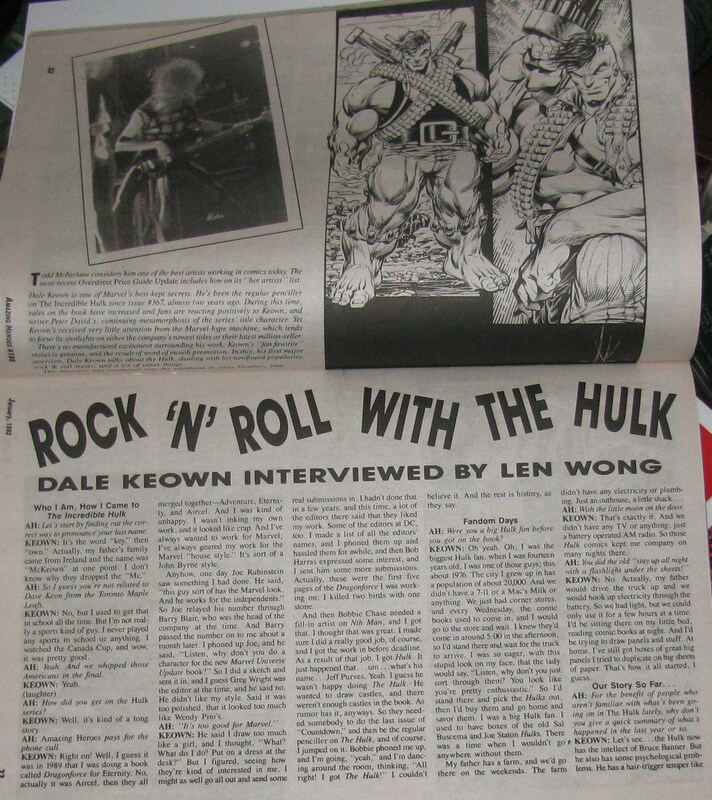 My prized possesion - The Incredible Hulk #1 - the only thing I am pretty damn sure won't plummet in value in my lifetime. 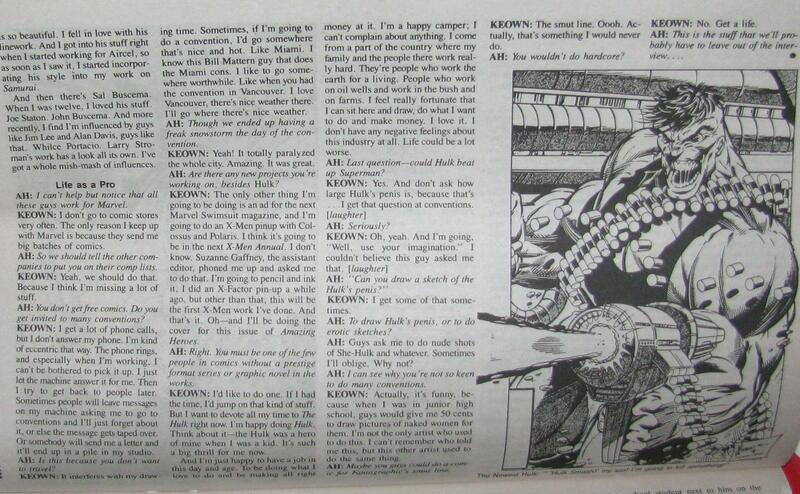 For all of you interested in reading the Keown interview – here it is – click on the image to see the full size and go crazy. It’s pretty long – but interesting. While I am digging other things out and rearranging the Hulk room (cleaning it) in order to take some decent pictures for you lovely people – here is a set of stickers that I picked up at my LCS sometime last year. 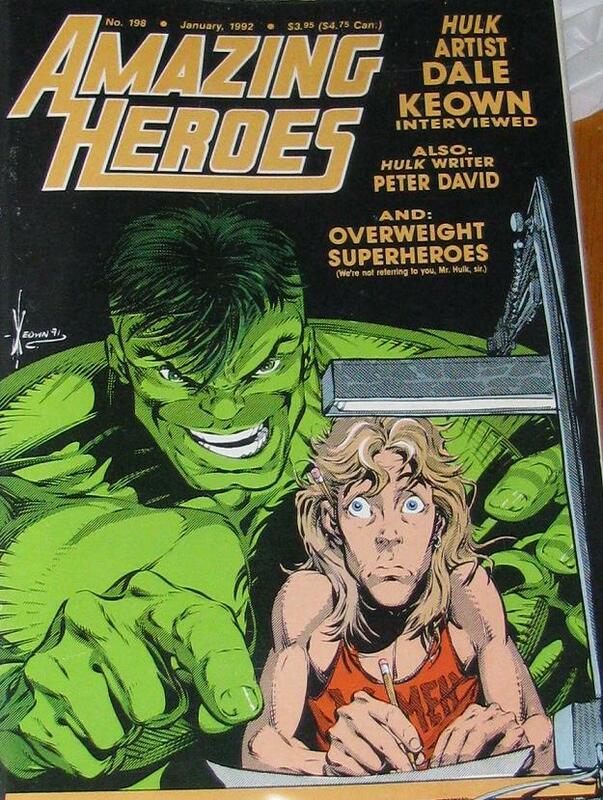 I think I liked this because of their choice for the Hulk cover. 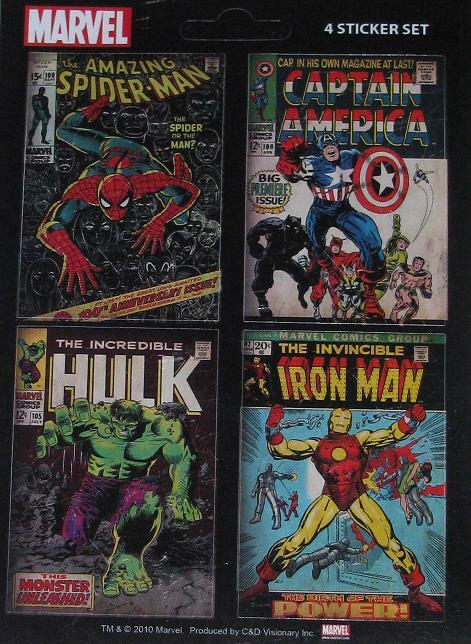 Too many times Hulk #1 or #181 or #377 – some iconic cover is chosen – which is fine, really. I get why – but this is the first time I saw them use the cover to #105. 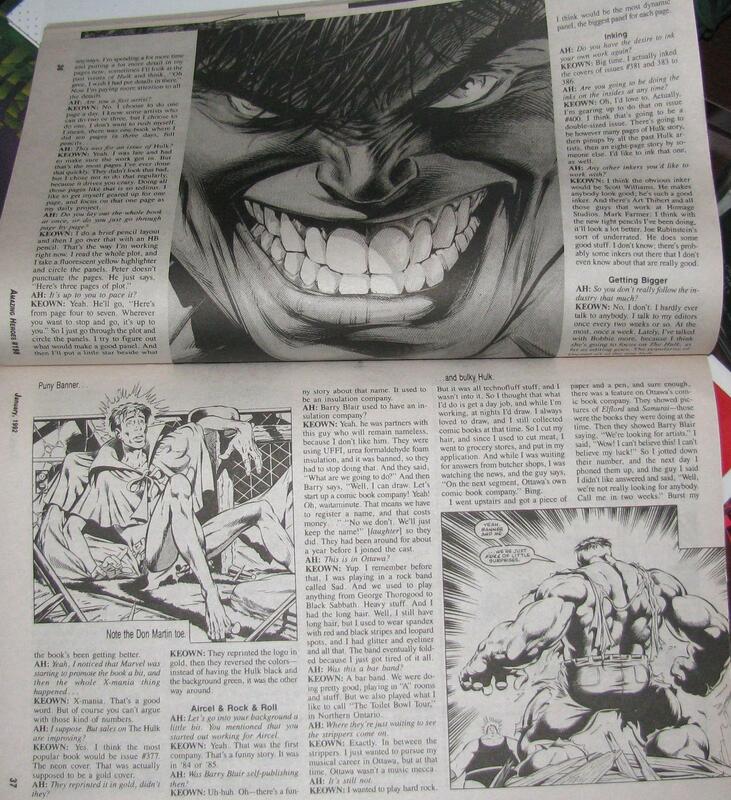 Nice choice – classic Hulk stuff is the best! 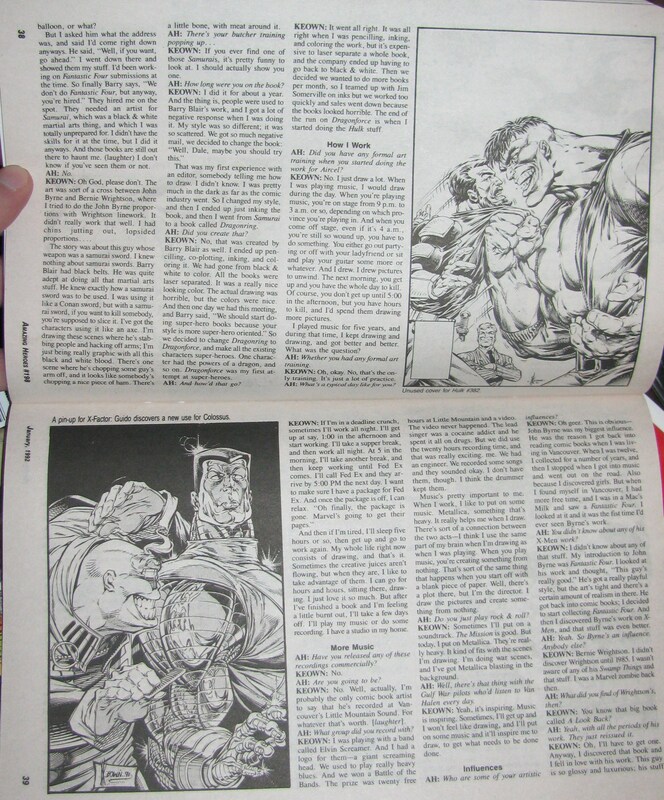 This mag from the 90’s was actually quite interesting to go through again – Keown talks about how he was looking forward to inking his stuff and that Marvel was going to give him that chance in TIH #400 – an issue he never came to draw. He jumped ship to Image to create PITT – a book that lasted, what? 20 issues over 10 years or something like that? How many people are still waiting for PITT to return? 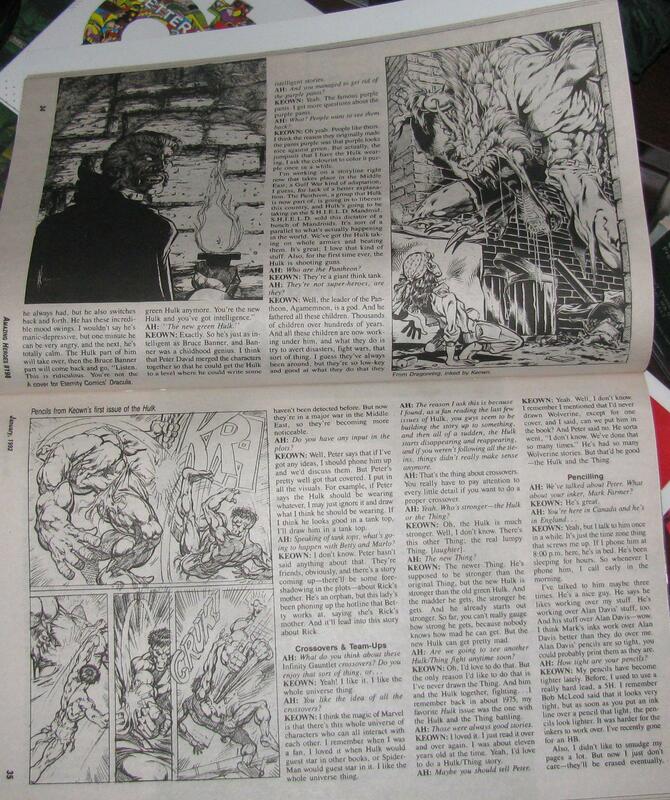 I remember reading an interview with McFarlane saying that they started to limit the number of books they were producing and WHO produced them – mainly because they did not want another “Keown” situation to happen. He’s infamous! That means he’s MORE than famous! 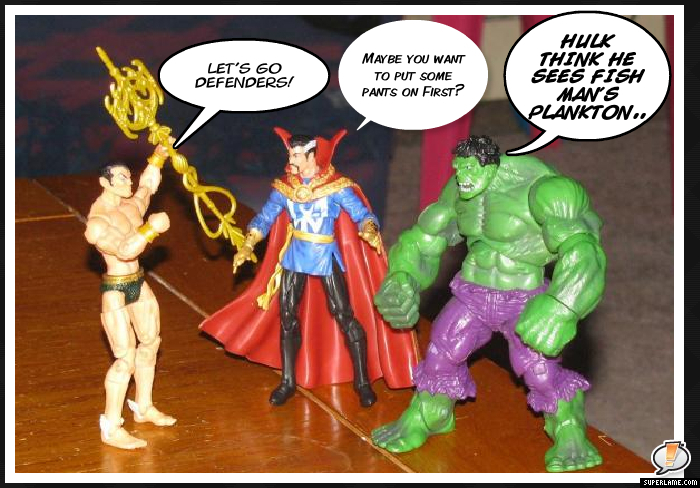 Finally – a Whole DEFENDERS Set! I know I will start to hear the debates on here – I can already hear some of you chiming in – but the REAL Defenders set can now be displayed thanks to the MU addition of Dr. 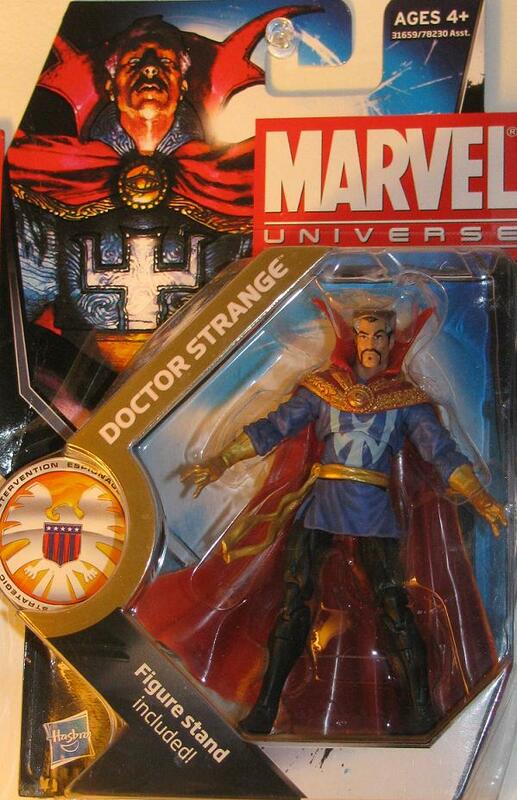 Strange being released. To me, it’s Namor, Hulk and Strange – and you can throw Surfer in there too if that’s your thing – I can take or leave the Surfer as a team member – but I also wouldn’t toss him out if someone added him in there. 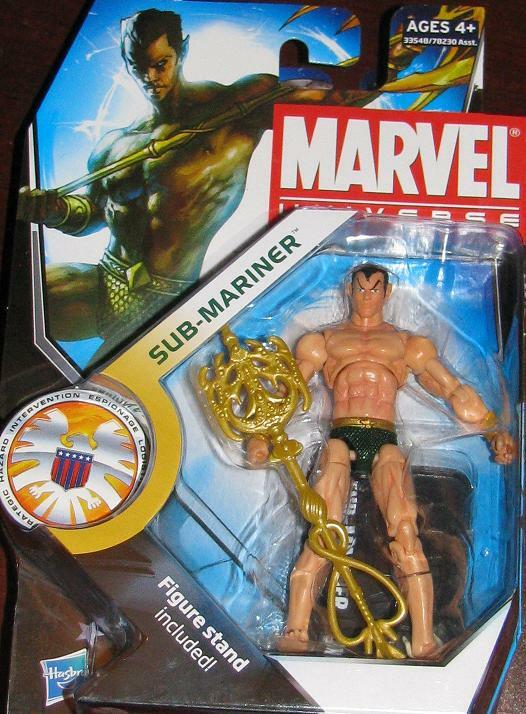 Now, I know they released a “fully clothed” Namor – but the better version just came out a bit ago. 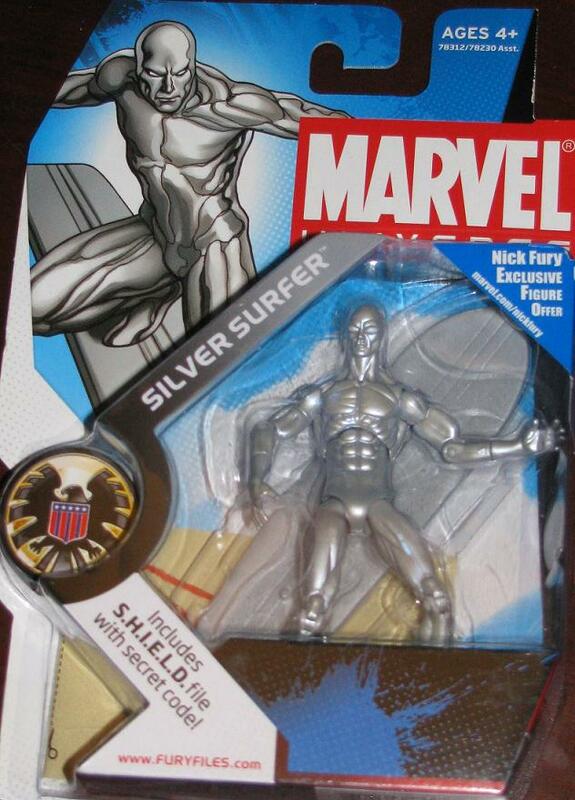 So yeah, like I said, get these – add them into your collection and display them proudly as a CLASSIC Defenders lover. 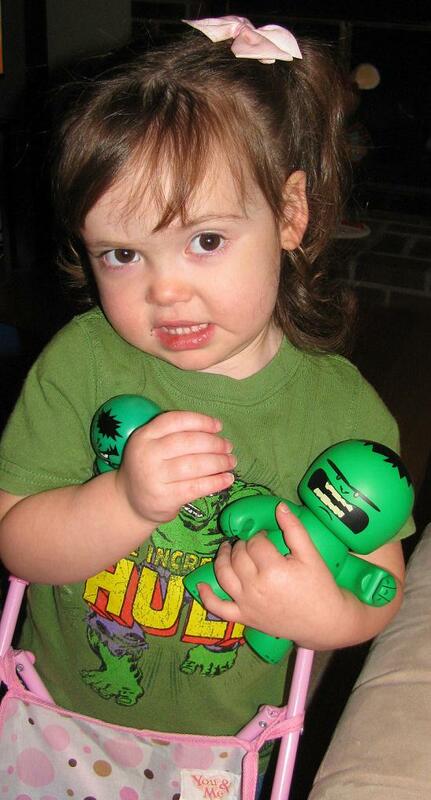 Lex – Littlest Big Hulk Fan? It’s been a while since I updated you on my daughter – and I must say she is growing up quite wonderful… and beautiful! Of course she gets that from her Daddy! And just to set the record straight – her Mother dressed her this morning – and I came downstairs this evening to see her playing with her Hulks. The Mighty Muggs one she calls the Mommy Hulk while the bubble head one is the baby. How stinkin’ cute is she?